Faced with the decision to rebuild my turbo or not, I looked around for people who had gone that route, and didn't see much information. 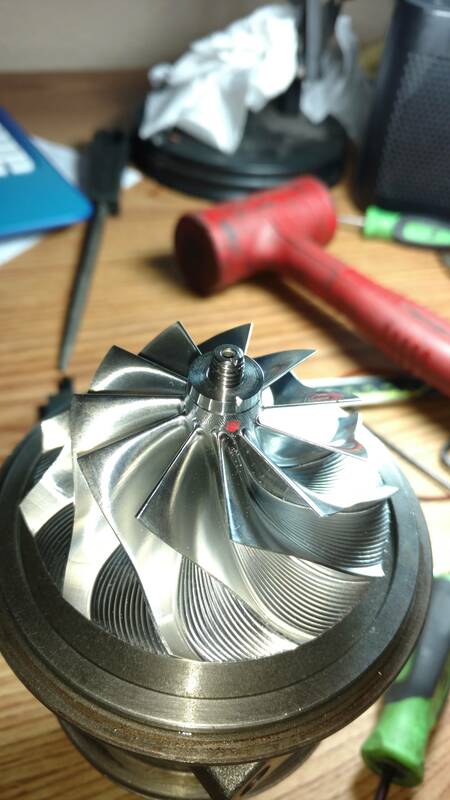 So I took the plunge and decided to do a little write up in case anyone else might debate rebuilding their own turbo someday. Hopefully this might be able to help someone someday, or if it doesn't turn out well, at least someone might be able to learn from my mistakes. Well after a couple good years, my Garrett gt3071r bit the dust. Due to being a full time college student and low on funds, I decided to rebuild the unit in stead of replacing. The turbo started making some noise, and smoking a bit. It sounded like there were rocks in the bearings. I stopped driving immediately and pulled the turbo. I purchased a rebuild kit from TurboLab for $170, and it seems like a pretty nice kit. 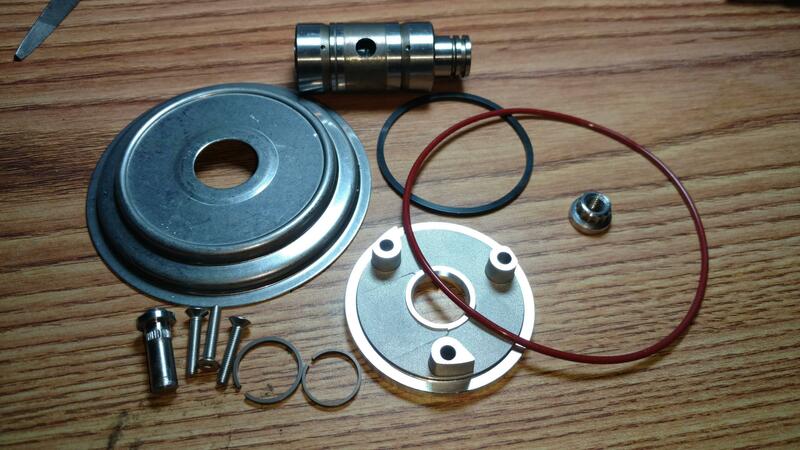 Comes with oil seals, O rings, hardware, compressor plate, shaft nut and new bearing assembly. 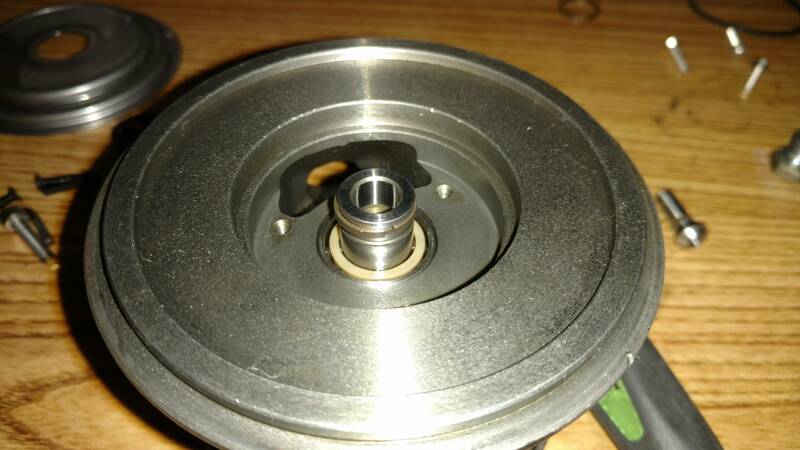 I did my research, and people seem to have good luck with the bearings coming out of Taiwan, and more than one rebuilder I spoke to suspected they came out of the same factory as the OEM units. Impossible to say, but they were dimensionally correct, and seem like they are decently made. 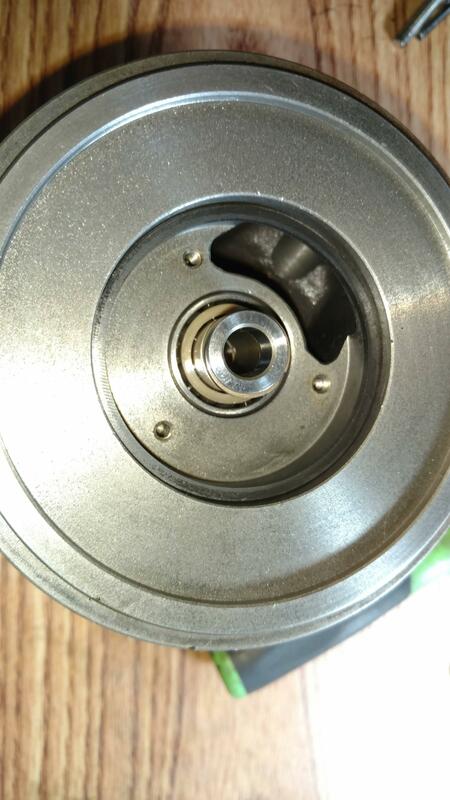 I decided to replace my compressor wheel as it had contacted the housing, and was a little worse the wear. 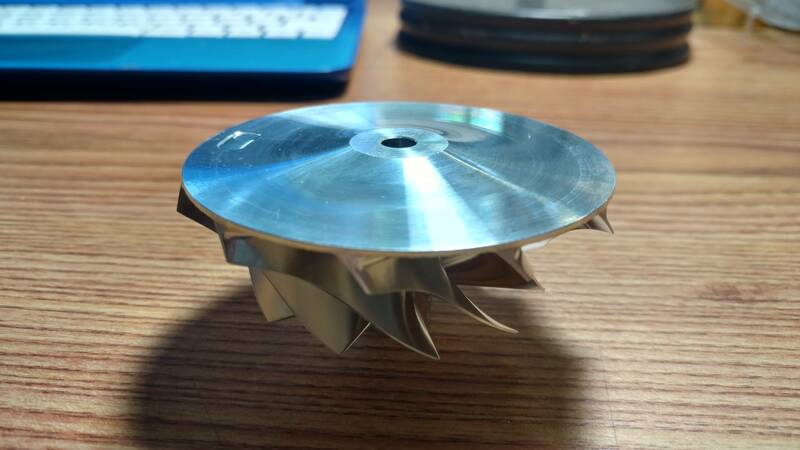 I decided to take a chance on an aftermarket billet wheel as an upgrade for the stock cast unit. 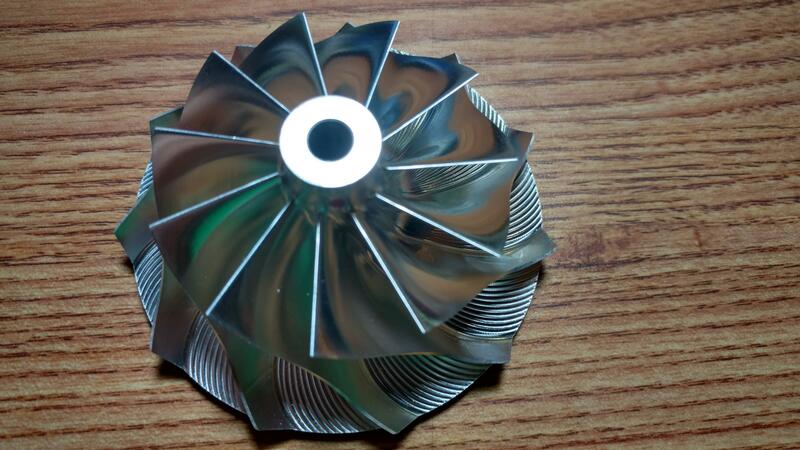 (hopefully) I spoke to the seller on ebay, and he makes clones of the newer gtx style 11 blade wheel, with a slightly trimmed exducer to fit the gt housing. The wheel was about the same price as a replacement cast unit, about $130. Got it in the mail and it's a great looking piece, all dimensions were perfect. Obviously I don't know if it will flow better or not. Time will tell, but to be honest, as long as it's not substantially worse than the stock unit, I'll be happy just to be back on the road. Just for some comparison, this is what the stock wheel looks like. It's cast aluminum, 6 long 6 short style. 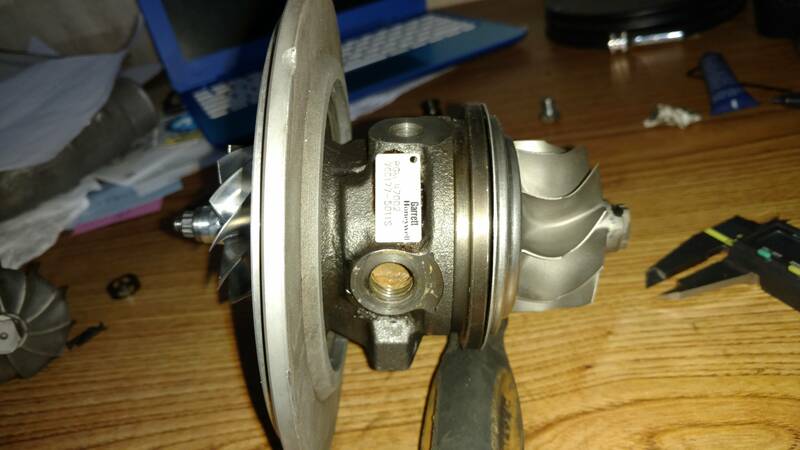 I had some problems getting my turbine housing off, so my turbo shop offered to disassemble the unit for another $40. I dropped off the turbo, and got some bad news a few days later. 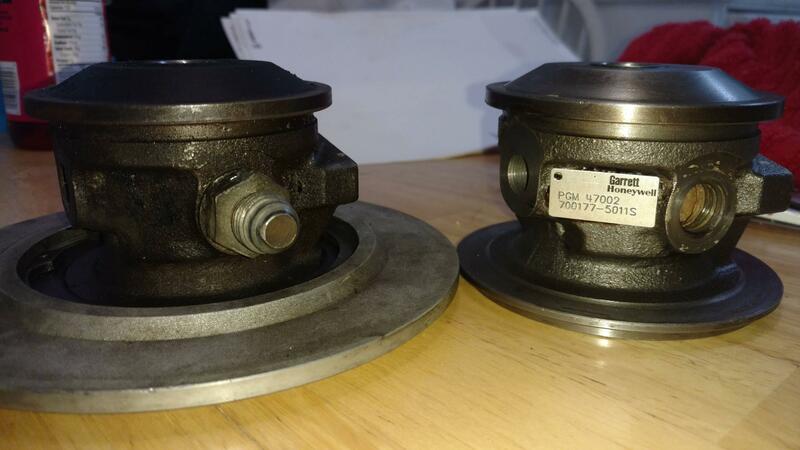 The turbine shaft had contacted the housing and done some damage that couldn't be repaired. 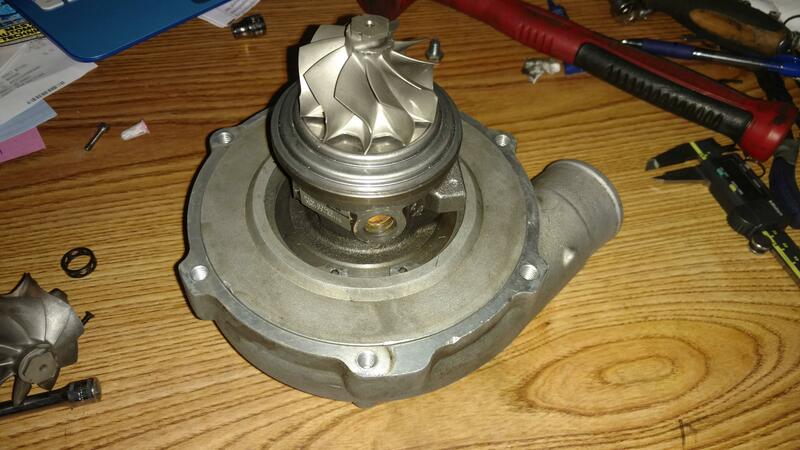 And apparently, according to my rebuild shop, it's not a garrett turbo. It's a cheap knock off. I have emailed 034 about the matter, and have not heard back yet. Luckily, my awesome rebuilder had some spare parts to sell me for cheap. 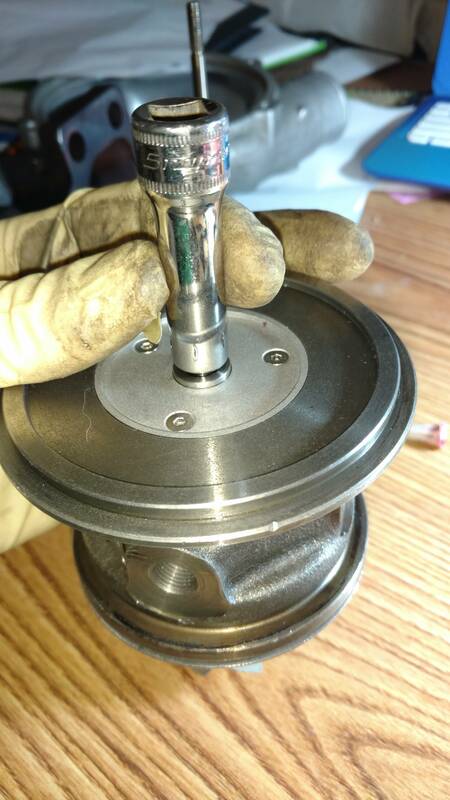 At the end of the day, I paid $250 for dissasembly, cleaning of my old parts, attempted machining of my old parts, a genuine garrett bearing housing, a genuine garrett turbine wheel, and the balancing of my new wheel on the shaft. To the left is what 034 sold me, on the right is the Garrett center. I'm not trying to bash 034, as I haven't verified his claim. For all I know it could be genuine. Can anyone tell me if this is genuine or not? It's obviously missing the name tag. 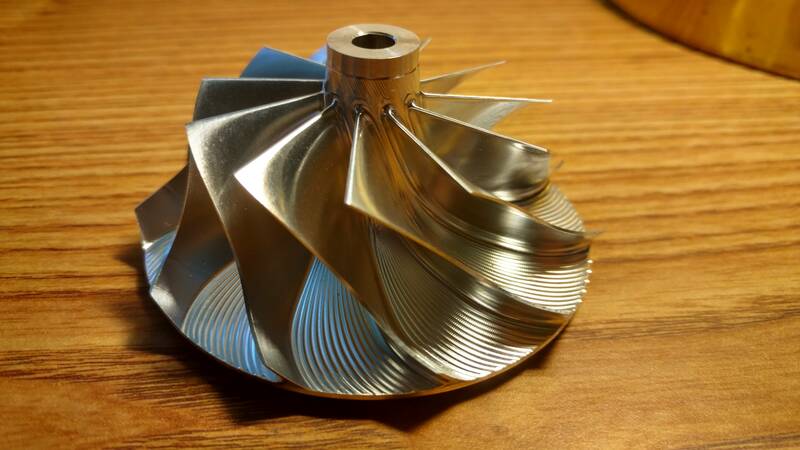 This is the old turbo. He said the CZ indicate it's from the Czech republic. Anyway, the rebuild itself was incredibly straight forward. This small plate has three small allen head screws to remove. 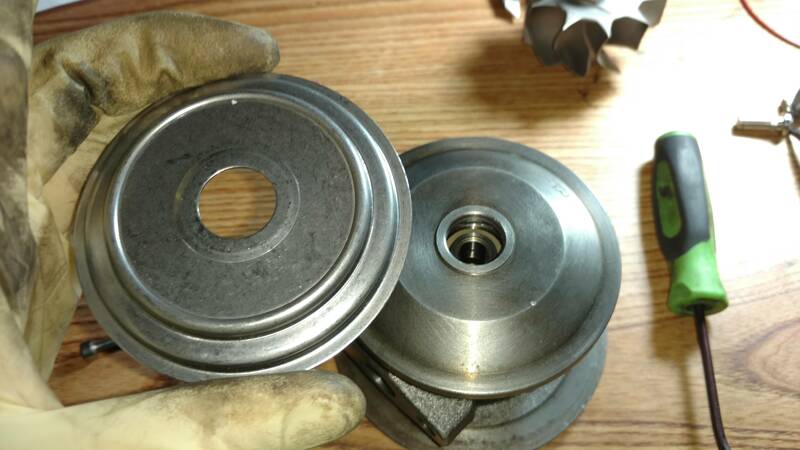 This is the bearing assembly. It just slides in and is held in place by the oil feed restrictor pin. The pin slides into the hole shown. 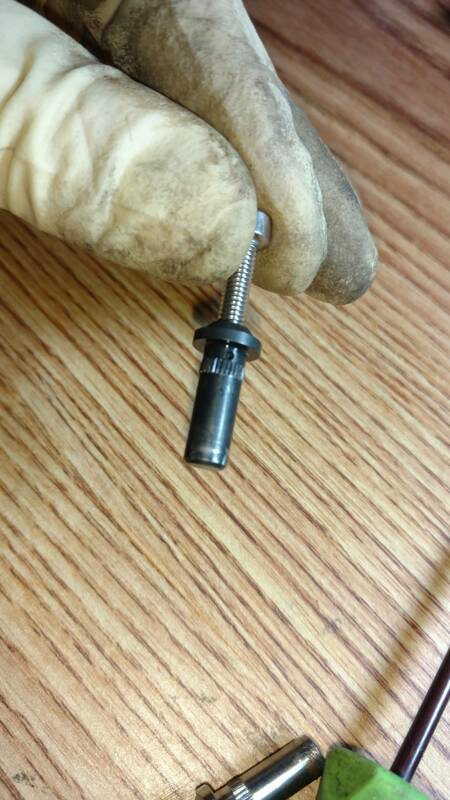 This is the oil restrictor pin. 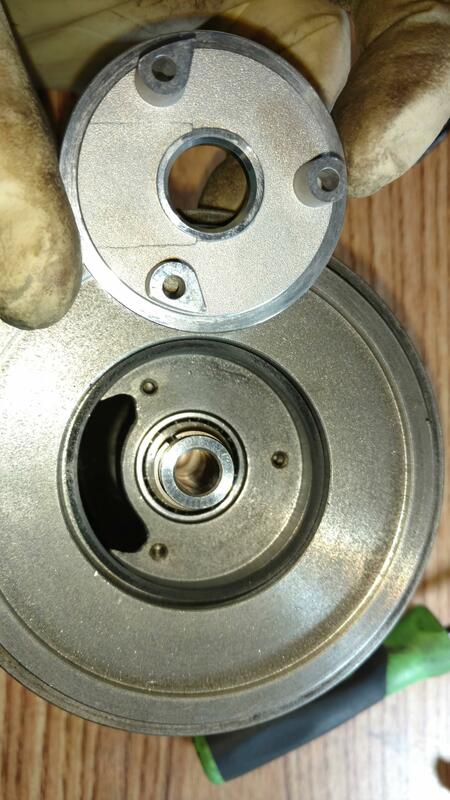 Just slide the bearing cartridge into the housing and press the restrictor pin in from the top. Oil seal goes on next. You can see it around the inner bearing race sticking up out of the center. 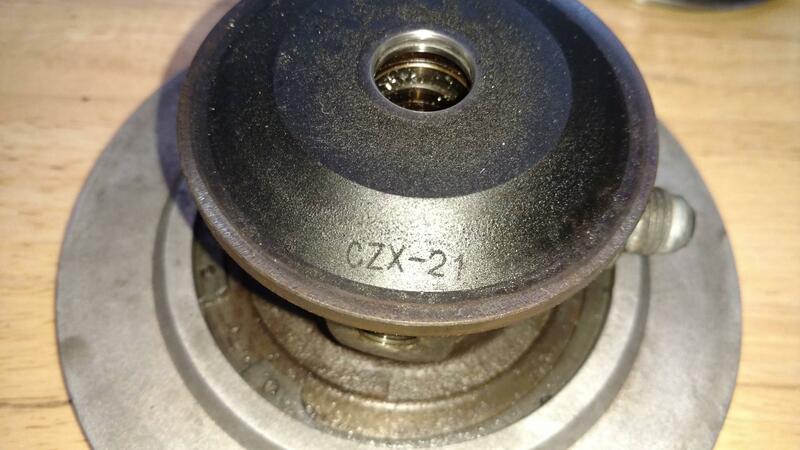 The oil seals are hard, square seals that slip on pretty easily, just try to avoid warping them while you put them on. 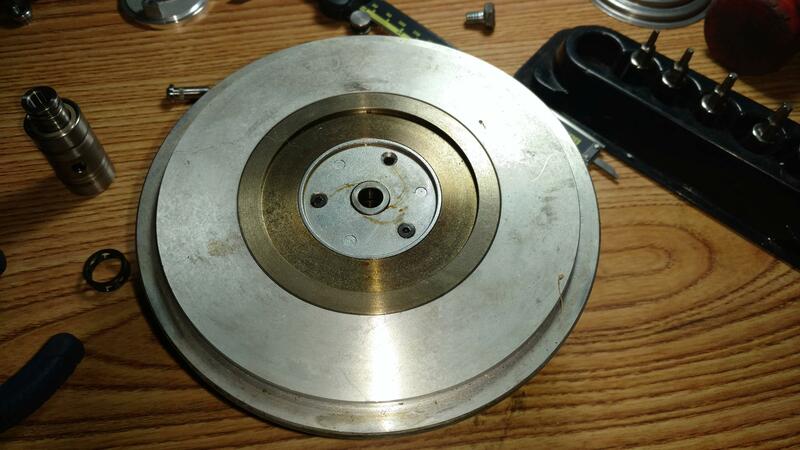 Try to keep them square, like when you install a piston ring. 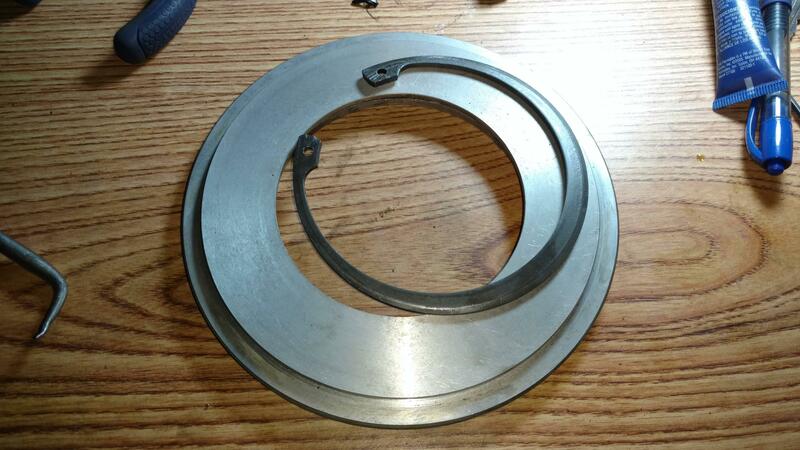 Kit comes with this new plate, along with an o-ring for underneath, and 3 new screws. I locktighted them in. Here it is installed. 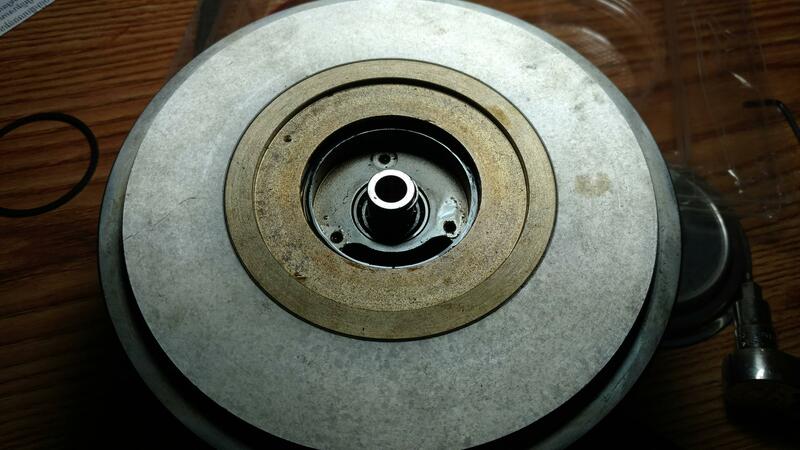 The plate clicks down with a satisfying noise as the oil seal seats inside the plate. That's it for the cold side. Really simple. The exhaust side has a heat shield that just sits in place under the turbine wheel. The housing will eventually clamp it down tight, but for now it just sits loosely on top. 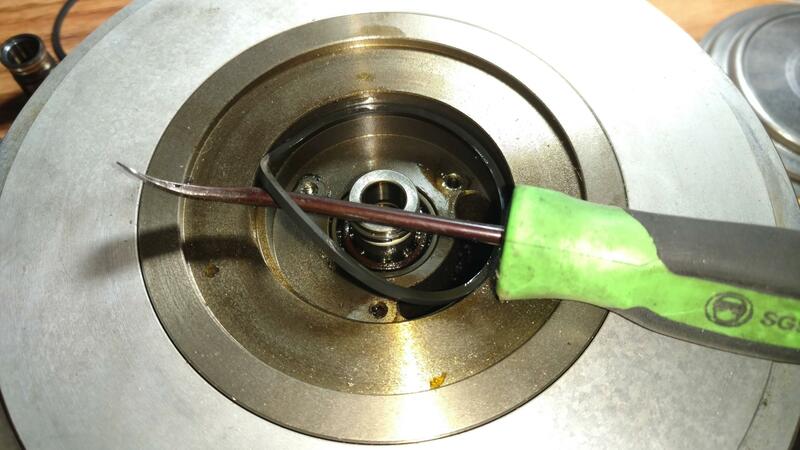 Oil seal for the exhaust is on the turbine shaft. You can see it installed here. 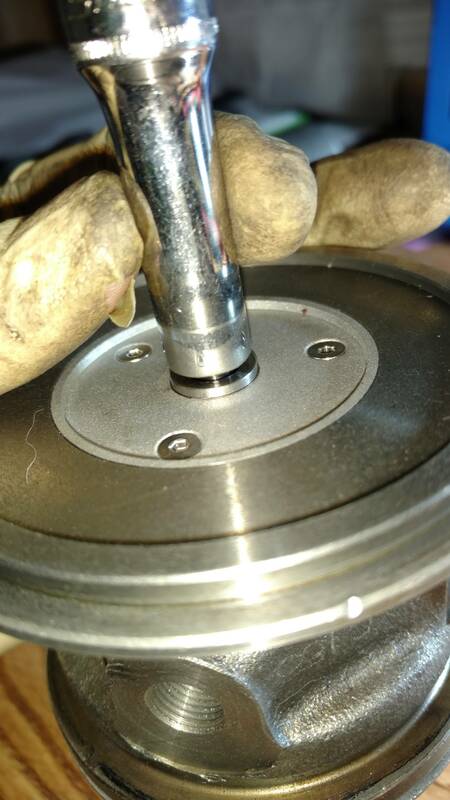 The shaft gets pressed into the bearing assembly. I hear different people have different experiences with the "pressing" aspect of it, but in my experience, I didn't use a press, just tapped it in. Whenever you press something into a bearing, if you're pressing it into the inner race, you need to support it below by the inner race. If you support the outer race, you risk damaging the bearing. Never transfer your pressing force through the bearings themselves, just whichever race you are working on. I used a socket to support the inner race from below. Shaft went in pretty easily with some very slight coaxing from a deadblow. Light tapping at best. The you can flip it over and set the compressor wheel on the newly installed shaft. You can see the marks made to indicate alignment after balancing. Obviously they need to be lined up. 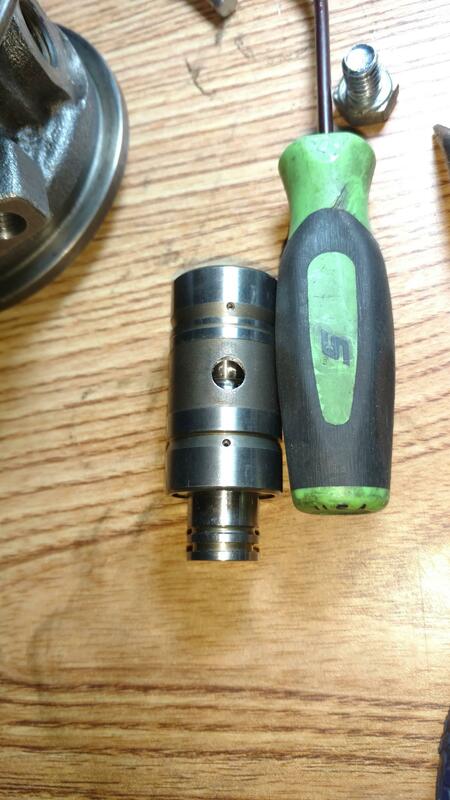 Shaft is reverse threaded. 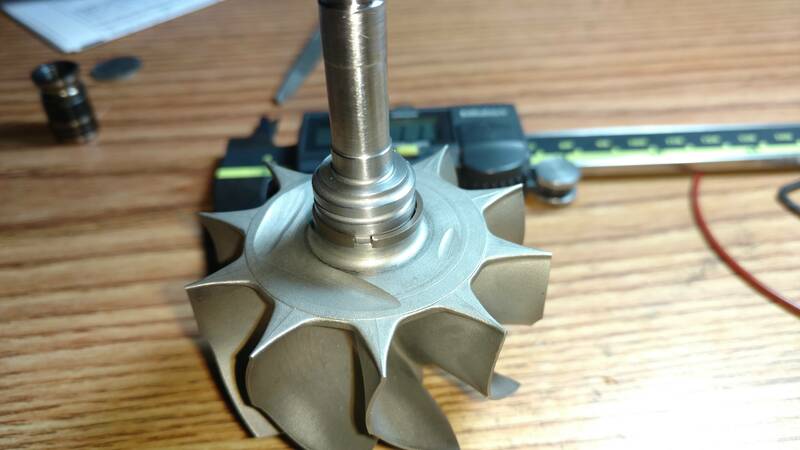 I aligned my balance marks 90 degrees apart, so that as I tightened the nut, the compressor wheel rotated with the nut until aligned. Nut is to be snugged, then rotated 90 degrees. I added red locktite just in case. And that's pretty much it. Ready to install housings and reinstall in the car. I haven't installed it in the car yet, but I will be sure to keep everyone updated on how it goes, whether or not it burns oil, and whether or not my new billet wheel performs better(or explodes). Last edited by maverick on Wed Apr 19, 2017 11:29 am, edited 4 times in total. That's pretty cool, never actually taken one of these apart. I would say most of the Garrett turbos I have seen do not have a tag on them like that. The castings look identical to me. They may have just been trying to get some $$ out of you. Can you see any differences? Have any pics of the damage tot he shaft? audifreakjim wrote: That's pretty cool, never actually taken one of these apart. I would say most of the Garrett turbos I have seen do not have a tag on them like that. The castings look identical to me. They may have just been trying to get some $$ out of you. Can you see any differences? Have any pics of the damage tot he shaft? He said the part number under the exhaust housing is what gave it away for him. He said the CZ indicates it was made in the czech republic. I'll keep people updated on what 034 says. I've checked their product page for the turbo, and any indication of being genuine or otherwise is decidedly missing. 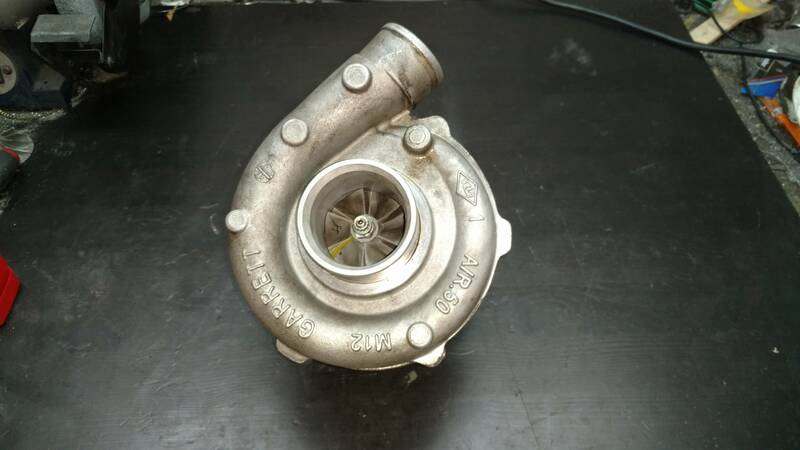 Nowhere does it say it's a garrett turbo, just a "gt3071r", but it has a garrett compressor map in the pictures, with a garrett watermark on it. I was definitely under the impression it was a genuine garrett. We'll see. 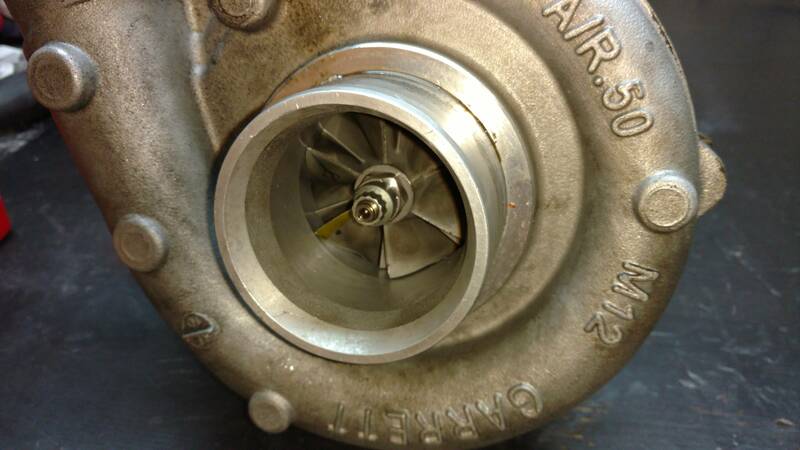 Fwiw when Hank rebuilt a couple of my turbos, the rebuild part isn't hard, but the turbo NEEDS to be balanced. Nice work otherwise! 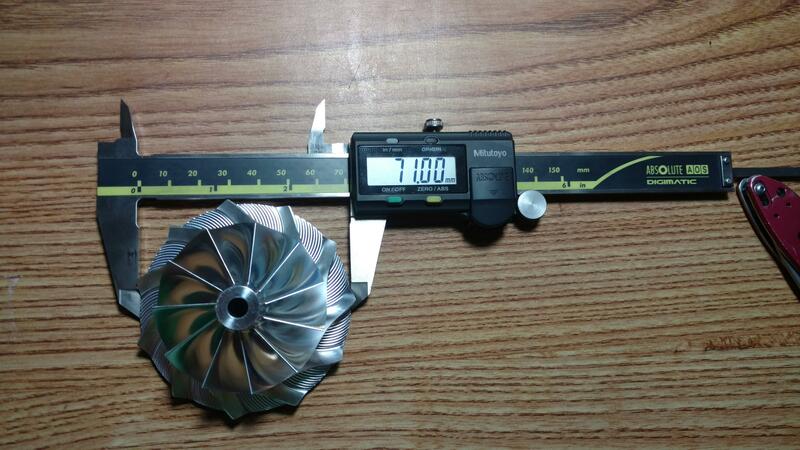 Yeah the rotating assembly was balanced at a turbo shop. Well I finally got around to getting it back in the car. Got everything back together and ran it, seem to be no leaks or anything. I decided not to put the turbo blanket on, thinking that perhaps that may have added to the excess heat which caused the problem in the first place. Initial drives went well, no more horrible noise, and no smoke, so it seems like it's all sealed up properly. Didn't go past 20psi or so, and honestly I really can't tell if the new wheel is performing better, worse, or the same. I'll take some logs and see if I'm running rich or lean anywhere. That should be a good indicator. Anyway I'm just relieved to have it back on the road! It's way too early to call it a success, but everything went really well, no problems I can see. I'll report back after I put some miles on it and up the boost! Fantastic! Here's to hoping it lasts more than a week or two. Good for you man! I hope it goes well. I rebuilt 2 holsets because I wanted the experience under my belt. Good job.